The Digital Equipment Corporation VAXmate with expansion box containing a 20MB hard disk, 1986. 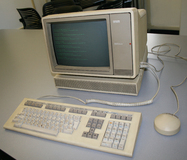 It was called VAXmate because, without the expansion box, it was an early diskless workstation (according to Wikipedia, the first commercial diskless personal computer), with VAX/VMS providing the file system over Ethernet. 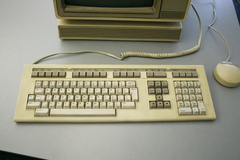 With the expansion box it is an IBM PC/AT-compatible personal computer, but with a DEC, rather than IBM, keyboard. This example from the Kermit Project at Columbia University was photographed in June 2011. It starts booting from its hard disk but doesn't quite finish. If it had finished I would have been able to show you what Microsoft Windows 1.0 looked like... in monochrome! (You can see a screenshot of a color version here).